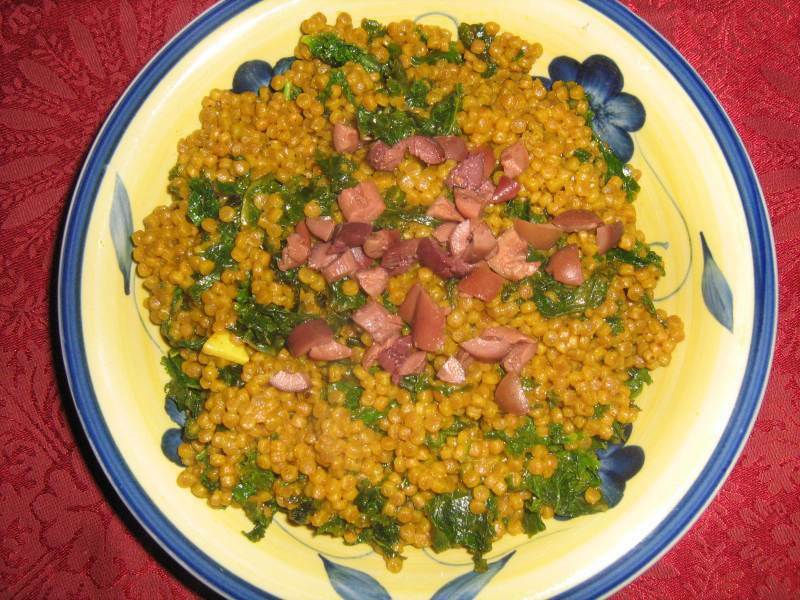 Our Couscous and Kale recipe is a tasty blend of Mediterranean spices, couscous and kale. By now you probably know how much we at All-Veg love kale! In our opinion it is a wonderful, delicious, nutrient-dense food that can be used in a variety of ways. In fact, we just had some fresh kale picked from our Earthbox garden and that reminded me of this couscous and kale recipe. And, of course, we have all heard so much about the health benefits of eating a Mediterranean style diet. The turmeric, in addition to its flavor, adds a nice coloration to the dish. Serve it with toasted pita wedges and hummous alongside some sliced tart apples. In a medium to large pot, bring to boil the vegetable broth. Sprinkle turmeric, cardamom and coriander over the boiling broth and stir in couscous. Reduce heat to medium and simmer per couscous package directions (about 8 to 10 minutes), stirring occasionally, until couscous is cooked through and broth is mostly absorbed. Place in mixing bowl and set aside. In large skillet over medium heat, heat olive oil. Add the sliced garlic and saute for a minute or two until it begins to soften. Stir kale into garlic, cover and cook for about 10 minutes more. Kale will reduce considerably. Stir kale mixture into couscous along with lemon juice, nutmeg and cheese if using. Season with salt and pepper. Garnish with chopped olives. Serve warm or at room temperature. Per serving: 340 calories, calories from fat 69, 8g total fat (1.2g saturated fat), 0g trans fat, 0mg cholesterol, 254mg potassium, 12.4g dietary fiber, 7.8g protein.